Watergate Cake is a recipe that has been popular for years and has stood the test of time. 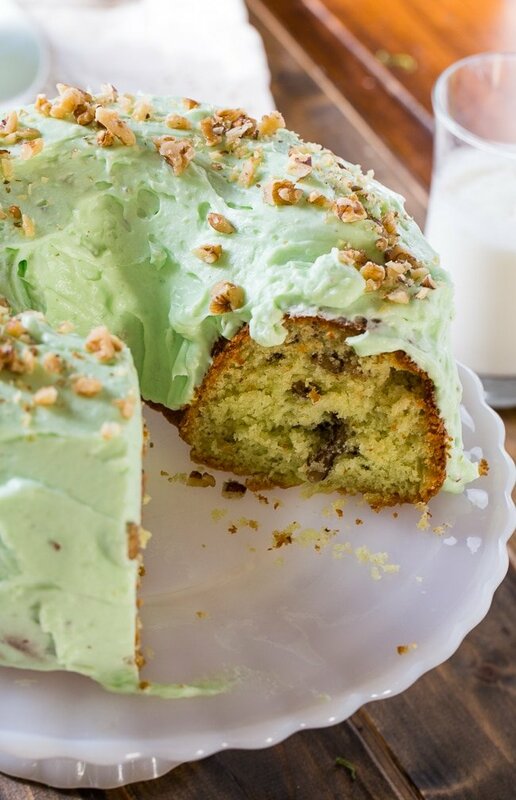 A box of cake mix, instant pistachio pudding, and Crisco® Pure Vegetable Oil combine to make a super moist and tender Bundt cake that’s then covered in a pistachio-flavored frosting. The holidays are all about reaching for those nostalgic recipes that bring back memories and remind you of holidays past. As children, we always received a bag of pistachios in our Christmas stockings and it was about the only time of year we ever had pistachios in the house so I always associate them with Christmas. Unlike most southern families, there’s not a long line of people who love to cook in my family. Neither one of my grandmother’s enjoyed spending time in the kitchen. But my Grandfather did. And this is his recipe for Watergate Cake which was printed in a cookbook that his church (St Paul’s Episcopal Church in Monroe, NC) published. I think he may have been the only male to submit recipes for the cookbook. My grandfather passed away nearly 20 years ago, so it’s nice to be able to bring back memories of him through his recipes. My grandfather in the center and me in the red shirt and knee high socks. I love this recipe for Watergate Cake because it is simple and quick to make and it brings back wonderful memories. Plus, it doesn’t hurt that it has a seasonally appropriate color. I’ve followed my grandfather’s recipe for this cake, but sometimes when I make it for the holidays, I also like to add some shredded coconut to the frosting or sprinkle it on top like snow. It goes wonderfully with the pistachio flavor of the cake. 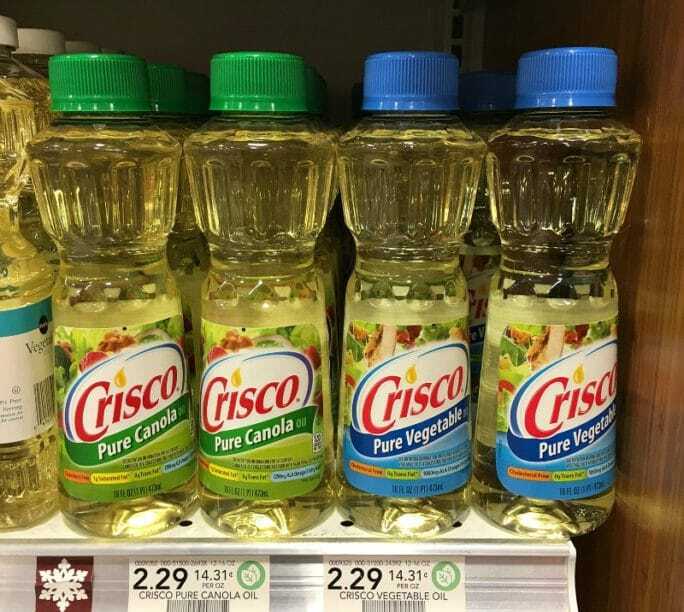 To make Watergate Cake, I use Crisco® Pure Vegetable oil which can easily be found in the baking aisle at Publix. 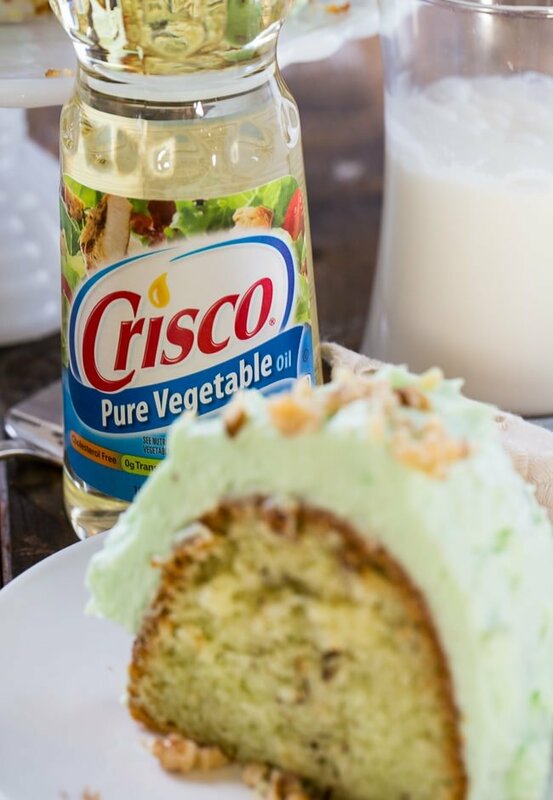 Crisco® Pure Vegetable Oil really makes the cake moist and tender and it has a perfectly neutral flavor that is great for baking. Visit Crisco.com for more information, tips, and recipes. Like Crisco on Facebook and Pinterest for more holiday baking ideas. Find more recipe ideas and Crisco® coupons at TheDessertDebate.com. 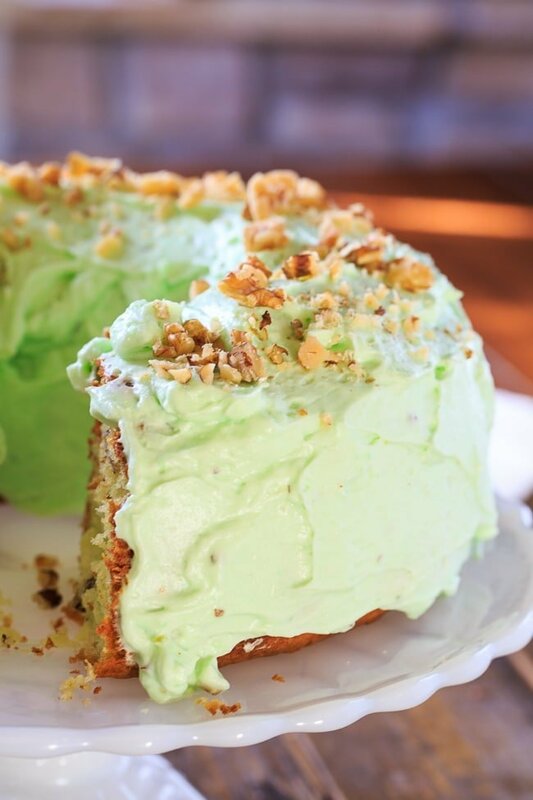 Watergate Cake is a retro dessert with lots of pistachio flavor in the cake and the frosting. Using an electric mixer, beat cake mix, 1 box of pistachio pudding, eggs, vegetable oil, and club soda for 2 minutes. Stir in walnuts. Pour batter into prepared pan and bake for 50 to 55 minutes. Let cool 5 minutes and then remove from pan to cool completely. To make frosting. beat 1 box pistachio pudding, cool whip mix, and milk until thick. Spread frosting on cooled cake. Top with walnuts. Use the pistachio pudding straight from the box. Do not make pudding with it. This entry was posted in Cakes, Desserts and tagged cake, pistachio. Bookmark the permalink. Growing up in deep South Texas, we always had Watergate Salad. All of my kids, grandkids included love Watergate salad. I’m so excited to see there is a cake version of this! Thanks so much. We also would have Fruit Cocktail cake and Nilla Wafer cake in the summer time. Such awesome classic timeless recipes that are oh so yummy! Hope you get to try the cake soon! I’m curious. Why is it called Watergate? Did they serve it at the restaraunt there? This cake was first invented in the 1970’s around the time when Nixon was president. The cake name was introduced because of his Watergate scandal AMD was a metaphor that sweet things (the frosting) may hide secrets under them(nutty cake) and because of this it was come to be known as the “watergate cake” becoming its most popular at the time that Nixon left office. 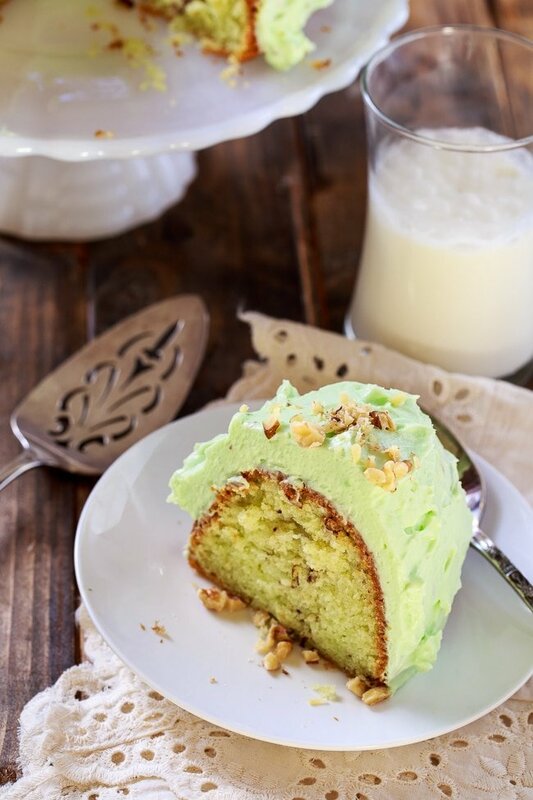 we always just called it pistachio cake, my daughter likes this so much she asks for it for her birthday cake. I’ve even used food coloring at Christmas time. very old recipe. I loved reminiscing with you…the cake is a treasure for sure! How have I never heard of this cake before?! I always use pudding mixes in our baked goods because it ads such great flavor, I have got to do this! I love that soft green color! 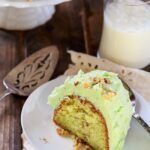 I’ve never heard of the cake before but I love that pistachio pudding frosting .. WOW!!! I can always learn something new here. This cake is so unusual and I love the color – how nice that you have the printed recipe and the memories to go it. I love seeing that pic of your grandfather and you!! How in the world have I never heard of a watergate cake?! I mean I love pistachios and cake! I feel gypped! And how awesome is it that this is your grandfathers recipe AND it was printed in the church’s cookbook!! Love that! I’m so sorry for the loss of obviously a wonderful man, I hope you can eat this cake and be reminded of all the fabulous memories, my friend! Cheers! I have some of the my Grandma’s church cookbooks from when she passed away and they are my favorite — some of my favorite recipes come from them! I love the classics and I LOVE how simple it is! Love that this is your grandfather’s recipe! And LOVE the picture! 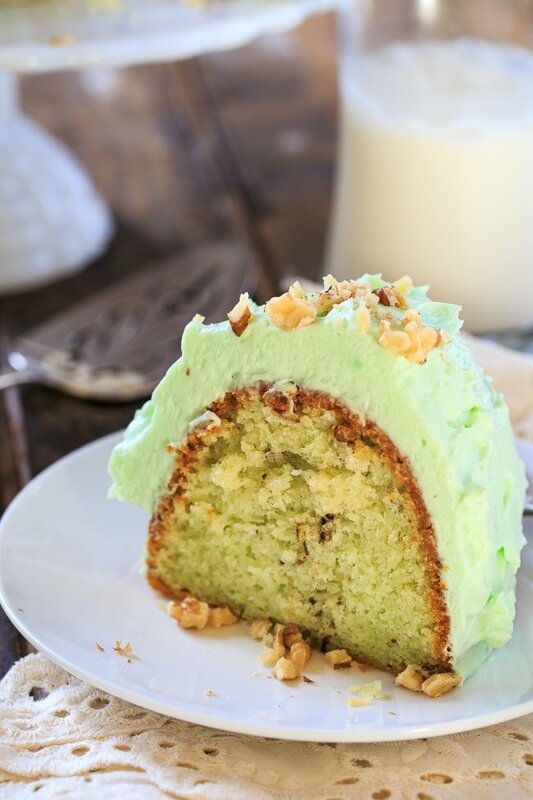 I?Watergate salad, so I am quite sure I’d feel the same about Watergate cake…which means that I MUST make this! That’s so nice that your Grandpa used to make this cake, Christin! What great memory! 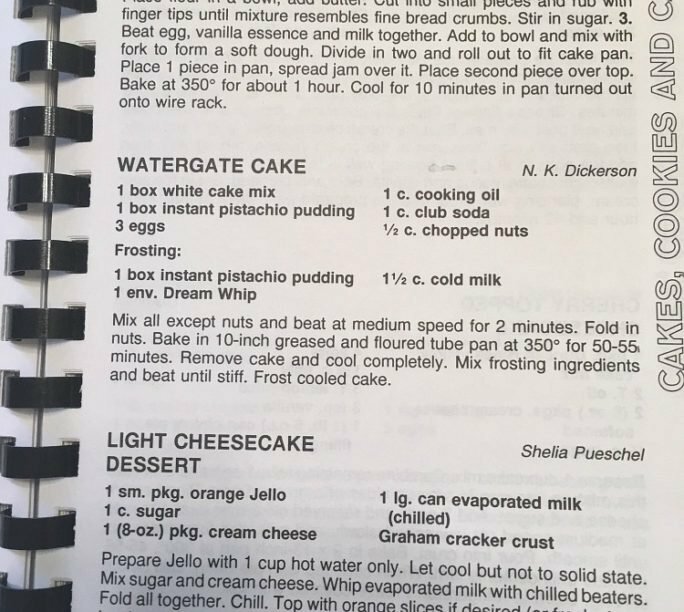 I’ve never heard of watergate cake before, but I love the sound of it. Looks delicious! I’ve never had a cake like this, but it sounds amazing! 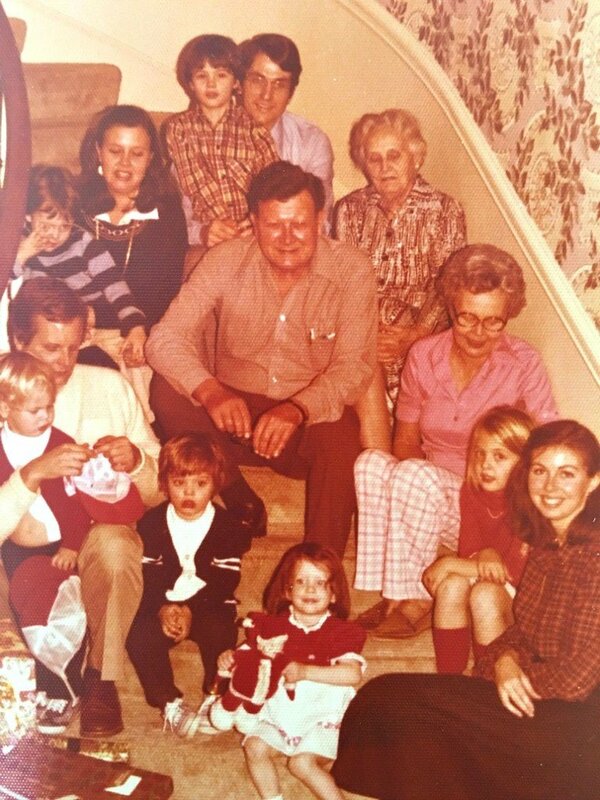 The family photo is just priceless, and I can totally tell that’s you in the red shirt — I love it! Wow! What an amazing cake! I have never had watergate cake before but I just love pistachios! And I love old fashioned recipes! Thanks for sharing Christin. Pistachios are the best! This is such a classic- love it!